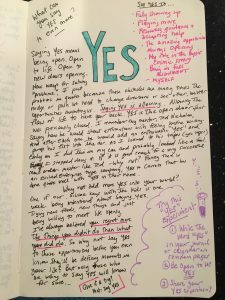 You see, I love the serendipity of writing questions, doodling, or jotting little notes to myself a few pages forward in my journal. 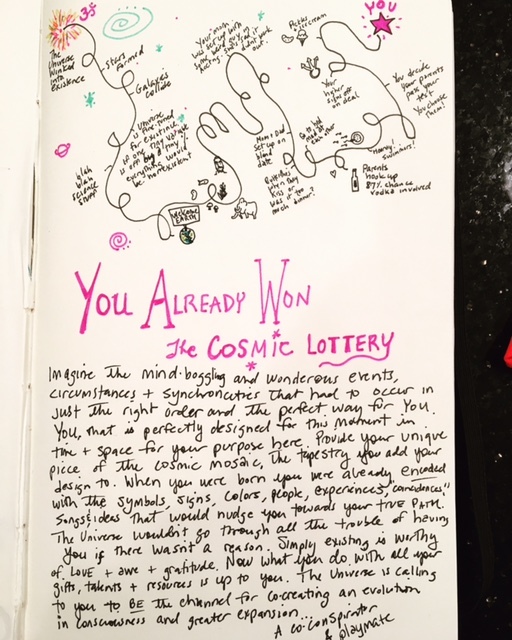 Then, when I “land” on that page, something magical usually comes together…. This question brings forth a profound inquiry of tapping into elevated wisdom from an extended point of view. Fact is, I love questions. I believe our questions dictate our answers and this is definitely one worth thinking through. However, I have a totally different direction for you…. First, I had to bring myself back to that time and place. It was 1984, and I played Dungeons and Dragons, loved eating Fruity Pebbles, and collected Smurfs. Makes sense. I realized that at age eleven I was a little more carefree. There was still an innocence to my life at this moment as it was 2 years before my parents got divorced. I’ve realized your first answer is not usually your “real” one. There is a deeper, more profound knowledge to be found by continuing to ask again and again. Here’s a process to go further…. You can tap into your full creativity by writing with your non-dominant hand. It feels odd when you start and maybe even totally silly or completely illegible, but it works. “It’s easier than you think because your heart always has your answer. You might not like the answer or it’s inconvenient, but it’s truth. If choosing between 2 choices – which one brings out more play? More joy? Random side note: Funny that using my left hand brought up my pet turtle I had for a short time as a kid. When I went away to the beach, my best friend Jamie was supposed to watch him, but the turtle (slowly) ran away. I attributed this insight to the “11-year-old enlightened Yanik” because that’s exactly how it feels. Kids provide some of the most amazing insights if you let them, and your own 11-year-old self probably has a message for you too. Think back to what you loved to do when you were 11 and what gave you joy. Now how can that be brought back into your life in a fully integrated way? Where can you mix this into your business or life in some way again – but now from a new, expanded perspective? One big thing for me was drawing. I actually thought I wanted to be a professional hockey player and then a cartoonist in the off season. I loved to draw and doodle and created my own characters, like “Meteor Mouse” and “Big Nose Fred.” I even created a comic book with my buddy Jamie under the imprint of “Silver Dragon Comics.” (His last name was Dragon, as you might have guessed.) It wasn’t really a profitable venture as we only sold 2 copies – to my parents and his – but I guess technically it was the start of my publishing career in a way. Years later, I started drawing and doodling again in my journals. 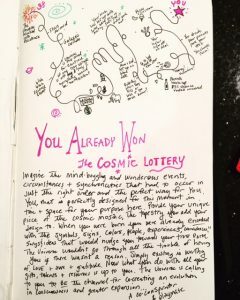 I realized how much I loved it and actually included all my own doodles into my new Evolved Enterprise book, on blogs, and even in some of our marketing. One hint you’re doing something you love is when time stands still or it generates more energy for you as you’re doing it. I remember writing the final draft of the Evolved Enterprise book and was totally beat at 3 a.m. and ready for bed. But at that moment, I realized I wanted to include my own doodles in there. Bam! It was a huge blast of inspiration, and I kept drawing for another two hours. Play is one of our most natural expressions of who we are in our perfected state, and it’s an incredible way to connect to anyone in your life. The other night, we had a dad and sons barbecue at my neighbor’s house. It was good food and wine (for the parents), but the real highlight was playing together. We played dads vs. boys in street hockey, basketball, and soccer with a quick S’mores break in between the final match ups. Simply playing together is one of the greatest joys we have together (and it didn’t hurt that the dads beat the kids 5-4 in a wild soccer match thriller!). The book, Play, by Dr. Stuart Brown covers why play is invaluable for relationships, learning, working together, and socializing as mammals. 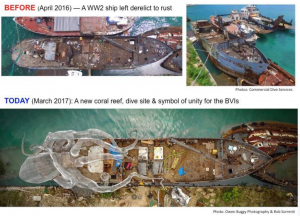 I like playing with words too, and there’s a reason “recreation” is another word for play – because it “re-creates” our world. Play is what we’re naturally drawn to if we simply give ourselves the permission to explore how we want to play within our lives and work. Sadly, most people believe work is in direct conflict to play, but that’s not the case. Have you ever been around someone who is simply playing? There’s an uninhibited joy that takes hold. There’s a loss of time, and we feel totally in the moment. Play is such a simple concept, but how much time do we even allow ourselves to explore what play really looks like? 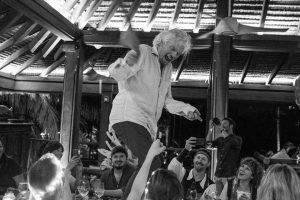 One of the characteristics I’ve seen up close many times from being around Richard Branson so often is his playful side. He is involved with serious projects, but he makes sure he doesn’t take himself too seriously. 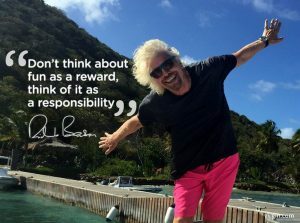 In fact, one of the rules on Necker is that there’s no work in the afternoons. Seeing Richard do this, I think he gets more productive time by focusing it all in allotted blocks and by continually rejuvenating and refreshing himself from playing more. 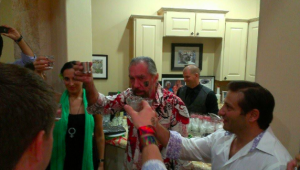 It’s not uncommon to have Richard instigating the party, dancing on tables, or generally mixing things up. I love showing up on Necker and having some sort of silly surprise for him or a small prank. 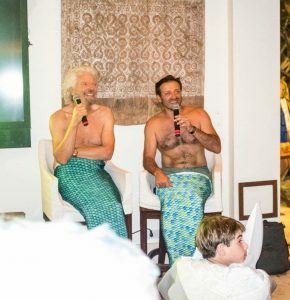 This year, in support of ocean conversation, we both donned mermaid (or merman!) tails for our Q&A. 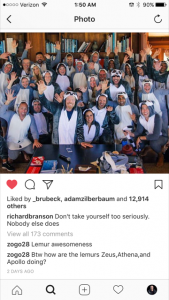 And last year we surprised Richard by having everyone on the island wear lemur suits for our “serious” brainstorming meeting. When he walked in, he just laughed and gladly jumped into his own lemur outfit. And putting that together was definitely fun! Quite frankly, our work doesn’t need to feel like, well, work. So often we discount what comes easily to us that actually feels like playing simply because it comes so easily and seems like such fun to us. For me, part of how I play is helping brainstorm better business ideas that can have a greater impact on the world. I love thinking of the unique positioning, the hooks, marketing angles, cause elements to bake in, and so much more. It’s so alluring for me to map all aspects and facets and how to create more leverage beyond what many others might see. To me, that’s fun! I love it! I love engaging in a potential problem like that and then figuring out the pieces to build something really meaningful using the Evolved Enterprise framework. I get a kick of asking the right questions to trigger the answers that move the needle. Or intuitively diagnosing the real buried issue that these entrepreneurs don’t even realize is hiding behind what they think their problem is. When I get out of my own way, I realize how valuable this really is for others. But since it feels like play, it’s too easy to discount it. 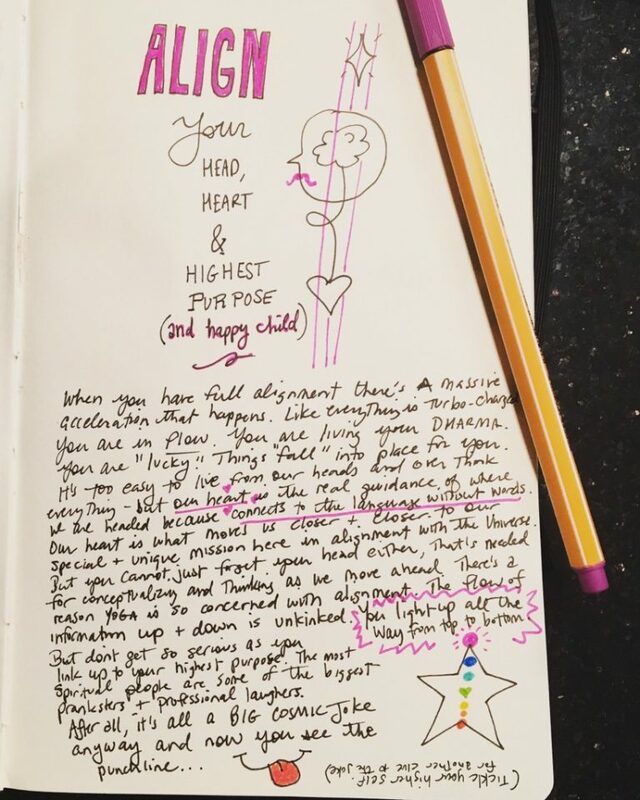 To not value our own worth and our unique expression of our work… Why does it have to be hard? That’s some sort of belief we’ve inherited somewhere along the way. It doesn’t have to be that way if you incorporate the belief that our work can be inter-meshed with our play. Play is one of the great unifiers to have all levels of people, no matter how successful, drop their walls. That’s why, at many of our Maverick experiences and retreats, you’ll see there are opportunities to play. There are deeper connections, opportunities, and friendships that develop when you’re randomly together on Tuesday night and have been transformed into zombies by a Hollywood make-up artist than when sitting around a conference room. Actually, one of my favorite playful events we put on is Camp Maverick, which is coming up. It’s absolutely a chance for the inner child to come out and play. 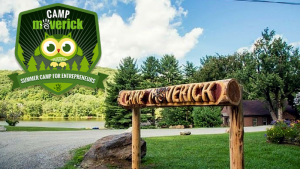 Imagine heading to sleep away camp with a group of exceptional entrepreneurs to learn, play, and make a difference. Basically, they’ve removed all the boring parts of going to a seminar and replaced them with summer camp awesomeness on a full 400 acres that we have all to ourselves. I don’t think I can quite do it justice, so watch the video here – www.GoCampMaverick.com. My mentor, Frank McKinney, says he can always spot when an adult has let their inner little boy or little girl die. They just don’t have that same spark in their eyes. And that spark is lit by playing more by adding more play into your work and your life. Think about what you loved to do when you were a kid and what your 11-year-old self would tell you. Was flying home from Denver on Friday, and while in the boarding line, I struck up a conversation with a remarkable woman, who just attracted me for some reason. First, she had a silver, vintage butterfly pin, and I told her how much I liked it. The gal behind us in line, who was also part of our conversation, mentioned that butterflies always remind her of her grandmother. For me, it’s my mom, who transitioned 11+ years ago. Instead of a typical response, this woman with the pin said butterflies were symbolic of transformation and rebirth. Okay, so who was this person? In further conversation, she mentioned she was a Jungian analyst. No way! My eyes lit up as I’m a huge Jung fan. We talked for only a few moments in line about her work, her coming to DC for a women’s march, and that she’s been an advocate for women’s rights for a long time, etc. She mentioned writing several books, including her latest, called Artemis. As we parted, I felt compelled to hand her a copy of Evolved Enterprise. It was the only one I just happened to have in my bag. I said I was involved with helping entrepreneurs make a difference in the world and thought there might be something in there that might connect us. As I sat in my seat, I felt a little silly as I looked up Artemis and then saw her extensive work. She had authored numerous books on female & male archetypes, symbolism, changing the world, activism, etc. Her name is Jean Shinoda Bolen. To give you a sense of the depth of her work, here’s part of her latest book description: Artemis: The Indomitable Spirit in Everywoman, a groundbreaking new book that explores the archetype of the activist. Indomitable means untamed, unsubdued. It is the one-in-herself quality in girls and women who will not be victims, no matter what. I had followed my intuition, but I thought maybe I had missed a turn here. I felt like I had “pushed” my work on her without truly establishing a deeper connection for why. She was sitting a few rows up from me, and I walked up before the flight to say I didn’t have any attachment to her reading the book and that she could just leave it in the seat—truly, whatever. And that was it. 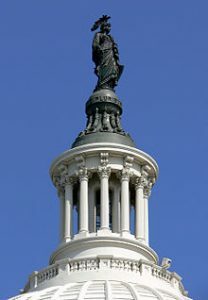 In my research on the Capitol, I knew about the statue of Columbia on top of the building and much of the symbolism, but I never knew about how the statue came to the U.S. and its remarkable storied past. 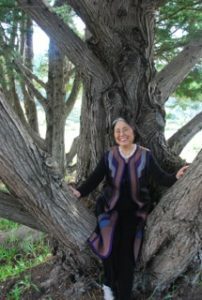 I did the ho’oponopono process on myself for the feeling of “wanting to be recognized,” and a few moments later, strolling down the aisle toward me is Jean. She said she skimmed through my book and realized we actually are a lot more connected than she realized. We had an empowering conversation about her advocacy work of helping create women’s circles. We discussed the combination of Malcolm Gladwell’s concept of Tipping Points and Rupert Sheldrake’s work with collective consciousness and how this is THE tipping point coming now with consciousness. I was so moved by all the women on my flight wearing their “cat hats” for the march. And the flight attendants asked everyone wearing the hats to get up so everyone could get pictures. I actually started tearing up seeing someone leading in her full voice, not embarrassed to be doing that on an airplane with others. Just pure heart-centered leadership. And the magic didn’t stop there, because I asked my seatmate if she was coming for the march too. After answering affirmatively, I pointed out a little “wink” from the Universe that we were on a “United” Airlines flight. I loved it. United is, unfortunately, not the story the media wants portrayed. They want an enemy to continue dividing up people in one camp or another. The march “against” Trump. It’s unfortunate the media has to continue the story line of labeling this as a “protest” instead of choosing words that would create more solidarity. The energy and feeling I got talking to different women coming in on the flight to Denver was more of a sisterhood of unity, not against something but standing in unity and solidarity as sisters, ensuring we do not go back. Couldn’t agree more. I’ve talked to several friends who marched in DC and who have never been “political.” I always believe there are powerful byproducts that arise from anything that seems “bad” or “good.” It’ll be interesting to see which byproducts are catalyzed from these defining moments happening now. Everybody has heard the advice do what you love and the money will follow, right? Unfortunately it’s not quite true. In fact, I’ve got a $400,000.00 lesson that I’ll share with you later on. However, running your enterprise from the fullest expression of love can and WILL create the meaningful success that matters. Yes, we’re moving into some slightly uncharted waters combining the words ‘love’ and ‘work’ together but stick with me. What does the ‘fullest expression of love’ look like? That’s because a business is always a reflection of the leader’s evolution. The wild thing is even if someone appears to be successful, they still could very well be existing in a slumbering type of half-hearted state. Frankly, I’ve made a lot of money without totally applying myself fully. And that’s not because I don’t care about my ventures or customers. If you get the mechanics around delivering exceptional value correct – you will be rewarded. But I think you can take it to another level. I’ve seen it over and over again with individuals seeming to have a great business but they are not fulfilled at a deeper level. They think business is just business and don’t consider how it could be their art. And that’s why so many people start looking for creative (or sometimes self destructive) outlets to compensate for not being totally engaged. Then that lack of energy carries over to your team, your work, and your customers. Truly everything. About 7 years ago, I made a significant transition. I went from ‘just’ being an Internet marketer teaching and helping others sell their knowledge online to my next evolution. I couldn’t see doing what I was doing for another decade or more. This wasn’t a complete 180. There were still so many parts that were fulfilling in what I was doing and that left clues for a bigger, more expanded version of where I thought I’d like to play. 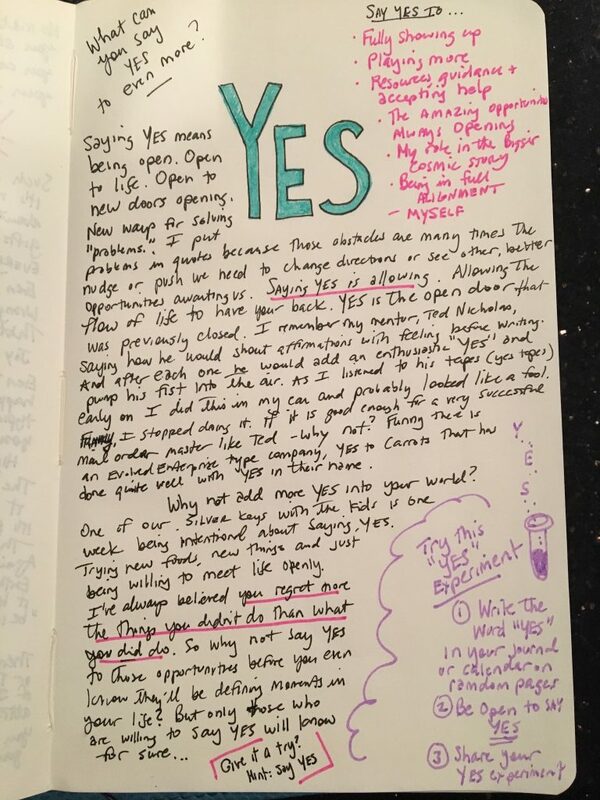 The idea for Maverick was rolling around in my journal for a long time and it really hit on so many things that lit me up; working with innovative entrepreneurs who not only wanted to grow themselves and their business, but also having a genuine impact in the world – while having some fun in the process. Truly changing the way business is played. Of course, I could have easily decided to continue doing what I’ve always done and let those ‘golden handcuffs’ get tighter and tighter. To me, it was almost like an awakening in a sense, and everybody goes through it at their own time and in their own way. The best way to think about this was an example my 6-year old daughter, Zoe provided. She really, really wanted a ‘wiggly’ tooth so bad. She kept checking her teeth but nothing was going on. Then finally she lost her first tooth a few months ago and 4 more followed in quick order. We can either resist this ‘cosmic alarm clock’ or lean into and embrace the transition into something bigger and better. Granted it’s not always a frictionless transformation. But those thoughts you have of ‘there’s something bigger I could be playing at’ or rationalizing work as just work. Those are all indicators that change is coming. Part of my evolution was truly deciding if I was really committed to what I was building with the Maverick Ecoverse or not. And that commitment was a bit trickier after my personal income took a nosedive sinking about $400,000.00 into the venture before figuring it out. Well you’ll continue getting bonked on the head with increased severity if you don’t figure it out. For me, it took finally selling my Aston Martin to cover payroll in order to make the changes we needed to get profitable. But I’m thankful for those experiences because it forced me to truly decide if the vision for what we were building was worth it or not. And that’s where passion really helps you with perseverance. Of course, you’re going to encounter set-backs and any venture is a zig-zagging process. And it was my love for the bigger mission – and that kept me going to figure out how to make it work. I believe I heard this from Brene Brown inside her awesome book Daring Greatly. It makes you think if whatever you’re doing is worth your life’s energy or not? It’s an even better question than one you may have heard before, ‘What would you do if you knew you couldn’t fail?’ The refined version forces you consider putting in your full heart & soul regardless of the outcome. This is something I’ve been practicing more and more after studying it through one of my favorite recent books The Great Work of Your Life: A Guide for the Journey to Your True Calling by Stephen Cope. Putting in the work (if it’s from a true place of meaning) is enough reward. Sometimes that concept may be difficult, but if we’re awaiting outside praise or recognition we’re always beholden to it. So if you can truly awaken from the autopilot nature of where you are – you can start to stir a deeper sense of direction. And that inner guide has the key to what you can be doing to re-invent or re-work your company or yourself. And at the highest expression is LOVE. Loving yourself and honoring yourself shows up in many ways. It takes time and it’s an ongoing process. I’ll recommend my friend, Kamal Ravikant’s book, ‘Love Yourself Like Your Life Depends On It . It’s a very personal story Kamal took as CEO of a venture-backed company in Silicon Valley and he went from depressed and blackness to fully engaged and living at an optimal level. You’ll have to challenge yourself to do the exercises in here for significant results. When you’re fully utilizing everything you were designed to do there’s a complete sense of divine inspiration and time stands still. The more you can truly ‘know yourself’ the better you can recognize where your sweet spot is. I’ve taken multiple personal assessment tests and would recommend Wealth Dynamics, StrengthsFinder, Kolbe and even the Enneagram. I don’t know why we’re wired this way, maybe it comes from when you were a kid and brought home your report card with all ‘A’s’ except one ‘C’ and your parents focused on the ‘C’. But for some reason we don’t really focus and develop our strengths that come naturally. Those are the sweet spots that bring more joy and energy into everything we do. Part of my journey has also been going deeper and exploring my ‘shadow’. This is a Jungian concept for a part that we want to repress and hold back typically from the light. And many times it comes up in all sorts of ways. It could be road rage and yelling at other people in traffic in front of your kids, it could be sexually acting out, it could be continually beating yourself up for not being good enough. One way you can often recognize a shadow is a behavior you see in others that elicits a charged reaction in you that really bothers you. Essentially, everyone around you can be a mirror for yourself and if there’s something that bothers you – usually it’s because you have this behavior and haven’t acknowledged it. 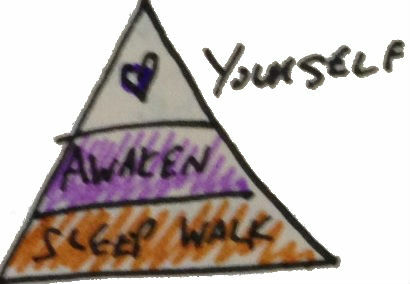 Many times just bringing awareness to your shadow is a fast step forward to integrating it more fully into who you are. Personally, one of my shadows was recognizing I was not ever giving 100%. I could see an interesting pattern looking back on my life. For instance in college, I’d go out the night before a big exam, come in late into the lecture hall smelling like bourbon, borrow a pencil and be the first one out. Even with that – I’d still get a solid ‘B’. And with my businesses, I’ve always done well and over-delivered but I’ve never given my everything. If I’m being totally honest, it’s probably because that leaves a little room to justify results if they are not what you hoped for. Loving yourself is also about taking care of yourself. One of my very astute friends, Richard Rossi, likes to ask ‘How would you treat a million dollar racehorse?’ Would you feed them junk? Would you let them not get enough rest? Would they get training whenever they felt like it? Or instead, would there be consciousness and intentionality in what you do? Of course there would. 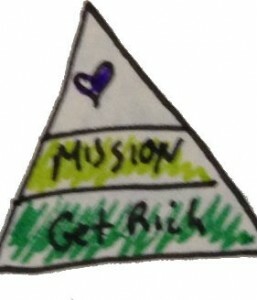 And you can probably guess where Richard was going with this – you’re the million-dollar racehorse. Actually I’d bet you’re worth significantly more than a mil. But how are you treating yourself? 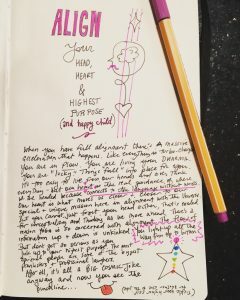 The Daily Return Path to Joy, Happiness and Bliss was part of my experiment to see how I can purposely work on making sure I’m the best I can be each day. Am I perfect? No, not at all but I know I’m consistently evolving and growing. Loving yourself fully changes the dynamics of how everyone around you reacts to you too. Because if we’re honoring your authentic vision there’s no time to say ‘Yes’ when you really should be saying ‘No’ to things that don’t support this. So many entrepreneurs I know are wired to be giving but they don’t make space for themselves. One of my most recent practices to create space for myself has been meditating. So far I’m at 20 minutes per day in the morning. I know quite a few entrepreneurs who meditate and it’s becoming bigger and bigger. 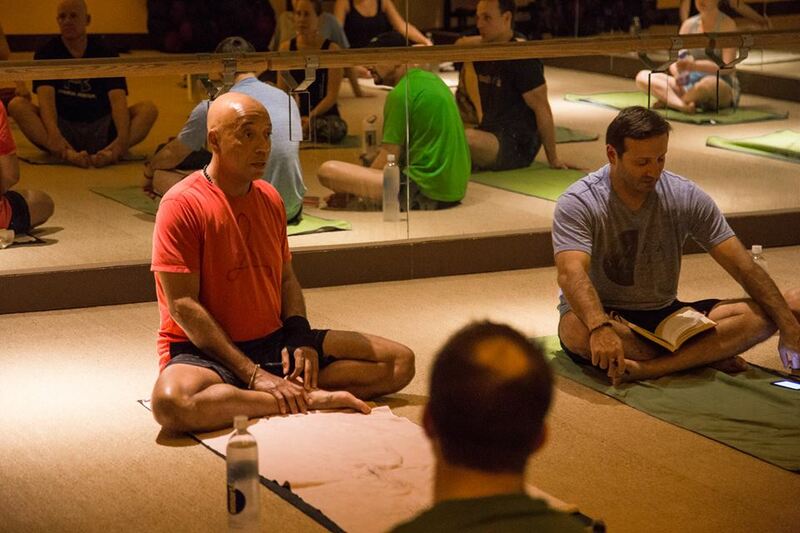 In fact, it came up in a big way as I was prepping to interview hip-hop mogul, Russell Simmons for a private Q&A with Russell and a Yoga session for Maverick members. Going through his latest book, Success through Stillness, the entire work is really devoted to meditation, yoga and a deeper stillness applied to business. I decided to make a commitment right there to try it in my life. His deep conviction for these pieces helped take his game to a whole new level and really impressed me. 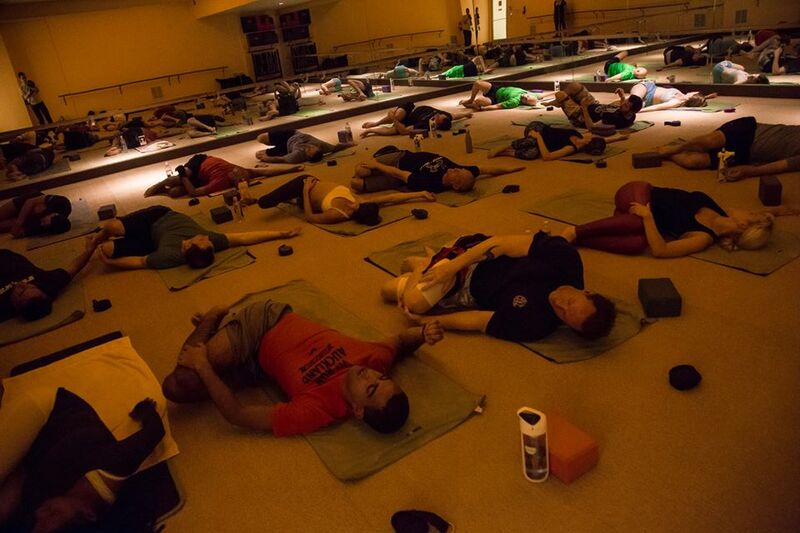 (The funny thing is Russell will candidly admit he only started going to yoga to check out hot ladies!) Also, I’d been paying attention to more and more research about the scientific benefits of meditation – so I decided to go for it. I can’t say it’s been a light switch type moment where my world has completely changed, but it’s a practice and one that I look forward to now each day. In these moments of stillness, I feel like I get centered on what’s important and what’s not. I see working on your own evolution as holographic for your business since we know everything really stems from you as the leader. Meaning a change to ‘you’ creates a change in your business too. It really does work that way. 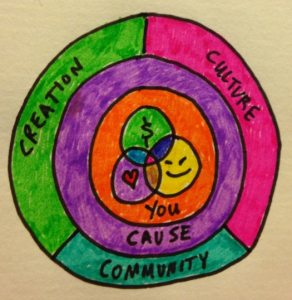 And it’s this full expression of love that shows up in different facets of your company, team and customers. By law, a corporation is its own entity, right? 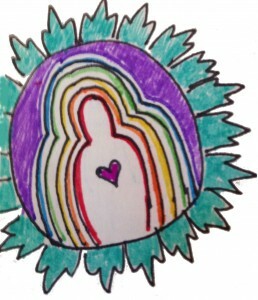 So as an entity (AKA a ‘body’), the analogy would continue that there is a ‘Soul’ inside. It might sound really odd but I think that’s true. Your business can stand for something more and just like we evolve, your business’ purpose can evolve too. Regardless if you set an intentional culture or not, there’s always a culture internally within your company. 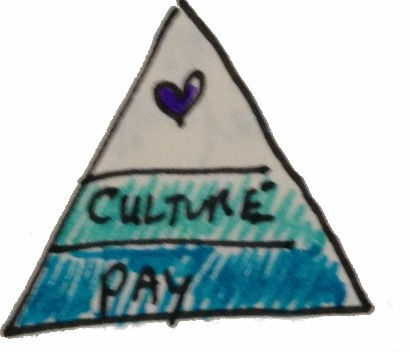 Your employees could be showing up just for their paycheck at the lowest level of engagement, coming together for the culture one level up or because they truly believe they’re playing a part in something bigger. And what if your goal as the leader was to help everyone on your team become the fullest expression of themselves? Same as your personal evolution, right? Your company becomes the container and catalyst for growth, learning and complete expression of their gifts & talents. Not everyone is wired to do their own thing but when you can give your team a ‘sandbox’ to build their dreams, they win and you win. Zappos is a well-praised poster child (for good reason) lately for taking their culture of happiness seriously. Just one of the perks there is having a ‘dream manager’ who helps their team figure out their dreams (i.e. owning a house, etc.) and making it happen. That’s huge. Starbucks has just raised their commitment to their team members by reimbursing them for online education. On our team we start with strengths testing and then through some trial and error help members experiment and move into roles best suited for them. We’re not perfect at this but we’re continually growing. And you can see changes in engagement when people feel they could bring their full selves to work. It makes a big difference. If I’m just selling something without a bigger meaning, I’m simply selling to sell no matter what. 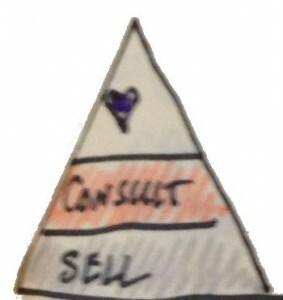 But raising the intention up a level is a consultative sale. But still on a whole different level is falling in love with your prospect. And if you’re in love with them that means you could do what’s in your customer’s true best interest. Which sometimes means no sale – but other times it means you must do everything in your power to get them to buy because you know the positive results they’ll have. If you love your prospect, you would be doing them a disservice to not get them to purchase, right? It’s a subtle but dramatic difference. And if there’s true love with the product or service that also creates a higher-level engagement with your customers/members/clients. On the lowest level of our triangle people are simply getting a need met. Your product or service is their solution so it’s transactional. 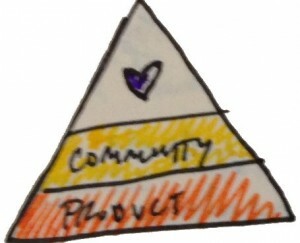 At the next level there is a community being built with a true identity tied in. (I shared an entire segment on Community Code 2.0: Building Beloved Brand Builders at the last Underground® event.) And finally at the highest level of expanded love, your customers see it as their responsibility to actually ‘convert’ others. Yes, almost evangelical. Don’t get me wrong about everything I’ve just covered. I think business is already a value driver and server or else it would be out of business, but by truly adding a genuine element of love it could be so much more. It can move from transactional, to transformational or even transcending business as usual. It could be an Evolved Enterprise. What do you think? What have you seen that reflects a fuller expression of something bigger through business?